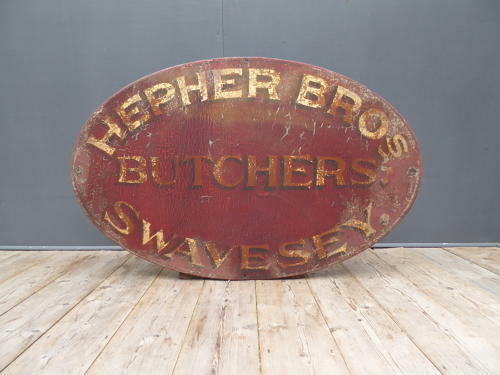 A beautiful antique butchers advertising trade sign for 'Hepher Brothers Butchers, Swavesey'. A wonderful, striking piece, hand painted on hardboard in some with a stunning 'time worn' look about it. The burgundy & gilt painted finish has taken on a wonderful age related patina over the years & the sign displays beautifully. Perfect for a kitchen, cafe or restaurant. Hepher Bros Butchers was owned by brother Charles & William Hepher & was located next door to the post office on Swavesey High Street, Cambridgeshire. Wear commensurate with age, untouched original condition.